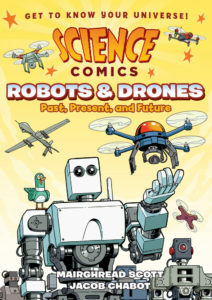 Happy Book Birthday, Science Comics: Robots and Drones! That’s right, everyone! My newest book with amazing artist Jacob Chabot is now available pretty much everywhere books are sold. That means you can get it right now at your local book store, or visit my publisher’s site where they have links to a bunch of book sellers. A lot of libraries will have it too. I just want to say thank you to my team at First Second, Dave, Gina, Mark, Calista, Robyn, Kiara, Andrew, Molly, Rob, John and Stephen for helping get this book published. Thank you to the incredible Jacob Chabot for bringing all my crazy ideas to life on the page. Thank you to our expert consultants James and Sabina, who answered all my tough questions. Finally, a huge thank you to all the librarians, teachers, and parents who help kids discover science through Science Comics. Now, what are you waiting for there’s a whole book of robots to go read about, get to it!